"Kansai" redirects here. For the airport, see Kansai International Airport. For the regional dialect of Japanese, see Kansai dialect. For other uses, see Kansai (disambiguation). "Kinki" redirects here. For other uses, see Kinki (disambiguation). The Kansai region (関西地方, Kansai-chihō) or the Kinki region (近畿地方, Kinki-chihō) lies in the southern-central region of Japan's main island Honshū. The region includes the prefectures of Mie, Nara, Wakayama, Kyoto, Osaka, Hyōgo and Shiga, sometimes Fukui, Tokushima and Tottori. While the use of the terms "Kansai" and "Kinki" have changed over history, in most modern contexts the use of the two terms is interchangeable. The urban region of Osaka, Kobe, and Kyoto (Keihanshin region) is the second-most populated in Japan after the Greater Tokyo Area. The Kansai region is a cultural center and the historical heart of Japan, with 11% of the nation's land area and 22,757,897 residents as of 2010. The Osaka Plain with the cities of Osaka and Kyoto forms the core of the region, from there the Kansai area stretches west along the Seto Inland Sea towards Kobe and Himeji and east encompassing Lake Biwa, Japan's largest freshwater lake. In the north, the region is bordered by the Sea of Japan, to the south by the Kii Peninsula and the Pacific Ocean, and to the east by the Ibuki Mountains and Ise Bay. Four of Japan's national parks lie within its borders, in whole or in part. The area also contains six of the seven top prefectures in terms of national treasures. Other geographical features include Amanohashidate in Kyoto Prefecture and Awaji Island in Hyōgo. The Kansai region is often compared with the Kantō region, which lies to its east and consists primarily of Tokyo and the surrounding area. Whereas the Kantō region is symbolic of standardization throughout Japan, the Kansai region displays many more idiosyncrasies – the culture in Kyoto, the mercantilism of Osaka, the history of Nara, or the cosmopolitanism of Kobe – and represents the focus of counterculture in Japan. This East-West rivalry has deep historical roots, particularly from the Edo period. With a samurai population of less than 1% the culture of the merchant city of Osaka stood in sharp contrast to that of Edo, the seat of power for the Tokugawa shogunate. Many characteristic traits of Kansai people descend from Osaka merchant culture. Catherine Maxwell, an editor for the newsletter Omusubi, writes: "Kansai residents are seen as being pragmatic, entrepreneurial, down-to-earth and possessing a strong sense of humor. Kantō people, on the other hand, are perceived as more sophisticated, reserved and formal, in keeping with Tokyo’s history and modern status as the nation’s capital and largest metropolis." Kansai is known for its food, especially Osaka, as supported by the saying "Kyotoites are ruined by overspending on clothing, Osakans are ruined by overspending on food" (京の着倒れ、大阪の食い倒れ, Kyō no Kidaore, Ōsaka no Kuidaore). Popular Osakan dishes include takoyaki, okonomiyaki, kitsune udon and kushikatsu. Kyoto is considered a mecca of traditional Japanese cuisine like kaiseki. Kansai has many wagyu brands such as Kobe beef and Tajima cattle from Hyōgo, Matsusaka beef from Mie and Ōmi beef from Shiga. Sake is another specialty of the region, the areas of Nada-Gogō and Fushimi produce 45% of all sake in Japan. As opposed to food from Eastern Japan, food in the Kansai area tends to be sweeter, and foods such as nattō tend to be less popular. The terms Kansai (関西), Kinki (近畿), and Kinai (畿内) have a very deep history, dating back almost as far as the nation of Japan itself. As a part of the Ritsuryō reforms of the seventh and eighth centuries, the Gokishichidō system established the provinces of Yamato, Yamashiro, Kawachi, Settsu and Izumi. Kinai and Kinki, both roughly meaning "the neighbourhood of the capital", referred to these provinces. In common usage, Kinai now refers to the Osaka-Kobe-Kyoto (Keihanshin) area, the center of the Kansai region. Kansai (literally west of the tollgate) in its original usage refers to the land west of the Osaka Tollgate (逢坂関), the border between Yamashiro Province and Ōmi Province (present-day Kyoto and Shiga prefectures). During the Kamakura period, this border was redefined to include Ōmi and Iga Provinces. It is not until the Edo period that Kansai came to acquire its current form. (see Kamigata) Like all regions of Japan, the Kansai region is not an administrative unit, but rather a cultural and historical one, which emerged much later during the Heian Period after the expansion of Japan saw the development of the Kantō region to the east and the need to differentiate what was previously the center of Japan in Kansai emerged. The Kansai region lays claim to the earliest beginnings of Japanese civilization. It was Nara, the most eastern point on the Silk Road, that became the site of Japan's first permanent capital. This period (AD 710–784) saw the spread of Buddhism to Japan and the construction of Tōdai-ji in 745. The Kansai region also boasts the Shinto religion's holiest shrine at Ise Shrine (built in 690 AD) in Mie prefecture. The Heian period saw the capital moved to Heian-kyō (平安京, present-day Kyoto), where it would remain for over a thousand years until the Meiji Restoration. During this golden age, the Kansai region would give birth to traditional Japanese culture. In 788, Saicho, the founder of the Tendai sect of Buddhism established his monastery at Mount Hiei in Shiga prefecture. Japan's most famous tale, and some say the world's first novel, The Tale of Genji was penned by Murasaki Shikibu while performing as a lady-in-waiting in Heian-kyo. Noh and Kabuki, Japan's traditional dramatic forms both saw their birth and evolution in Kyoto, while Bunraku, Japanese puppet theater, is native to Osaka. 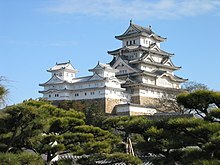 Kansai's unique position in Japanese history, plus the lack of damage from wars or natural disasters has resulted in Kansai region having more UNESCO World Heritage Listings than any other region of Japan. The five World Heritage Listings include: Buddhist Monuments in the Hōryū-ji Area, Himeji Castle, Historic Monuments of Ancient Kyoto (Kyoto, Uji and Otsu Cities), Historic Monuments of Ancient Nara, and Sacred Sites and Pilgrimage Routes in the Kii Mountain Range. International schools have served expatriates in the Kansai region since 1909. Outside of Tokyo and Yokoyama, Kansai has the largest number of international schools. In 1909, Deutsche Schule Kobe was founded to serve German, Austrian and German-speaking Swiss expatriates, traders and missionaries living in the Kobe area. After a long history of teaching a German curriculum, the school changed to The Primary Years Programme (PYP) in 2002. Today, Deutsche Schule Kobe/European School provides curriculum in three languages: German, English, and Japanese. In 1913, Canadian Methodist Academy opened its doors to sixteen children. The school, renamed Canadian Academy in 1917, served children of missionary parents from grade one through high school and offered boarding facilities for students from throughout Asia. Today, the day and boarding school offers a PreK to Grade 12 education on the campus on Rokkō Island, a man-made island. The school, which is no longer affiliated with Canada or the church, is the largest school for expatriates in Kansai. The school is approved by the Japanese Ministry of Education and accredited by the Western Association of Schools and Colleges(WASC) and the Council of International Schools. The school awards both the International Baccalaureate (IB) and U.S. high school diplomas. The number of international schools burgeoned after World War II. In 1946, St. Michael's International School was established by Anglican Bishop Michael Yashiro and Miss Leonora Lee, a British missionary. Today, the school offers a distinctive British-style primary education based on the National Curriculum of England and Wales. The school has joint accreditation from the Council of International Schools and the Western Association of Schools and Colleges. Brother Charles Fojoucyk and Brother Stephen Weber founded Marist Brothers International School in 1951 after communist authorities pressured them to leave Tientsin, China. Today, the international Montessori - Grade 12 school enrolls approximately 300 students. The school is accredited by the Western Association of Schools and Colleges. In 1957, a missionary homeschooled her son, his best friend and another student in their home. The next year, the home turned into Kyoto Christian Day School and a full-time teacher was hired. The school was renamed Kyoto International School in 1966. Today, the school serves students from two to fourteen years old. The school has bee accredited by the Western Association of Schools and Colleges (WASC) since 1992 and authorized by the International Baccalaureate Organisation (IBO) since 2006. Kansai is also served by Osaka International School, Lycée français international de Kyoto as well as Chinese and Korean schools. Daisen Kofun, the largest burial mound in the world. Hōryū-ji Golden Hall, the oldest wooden structure in the world. Daibutsu at Tōdai-ji, the largest bronze statue in the world. Tōdai-ji Main Hall, the largest wooden structure in the world. Lake Biwa, the largest lake in Japan and 3rd oldest lake in the world. Izumo no Okuni, who founded Kabuki in Kyoto. Kongō Gumi, used to be the world's oldest continuously operating company, constructed several Japan's cultural assets. Amanohashidate, one of Three Views of Japan. Sen no Rikyū, a merchant from Sakai, perfected the courtesy of tea ceremony. Japan's tallest temple pagoda in Tō-ji, Kyoto. Nintendo became the world's most successful video game company. ^ "International comparison of GDP of Japan's Prefectures: Tokyo's GDP is bigger than Indonesia's?!". realestate.co.jp. 13 August 2015. Archived from the original on 1 May 2018. Retrieved 3 February 2017. ^ "Yearly Average Rates". UKForex. Archived from the original on 16 March 2015. Retrieved 3 February 2017. ^ Nussbaum, Louis-Frédéric. (2005). "Kansai" in Japan Encyclopedia, p. 477, p. 477, at Google Books. ^ "Mie Prefecture homepage: About Mie (pdf)" (PDF). Archived from the original (PDF) on 2008-04-08. Retrieved 2008-04-10. ^ "Kansai Region Travel Guide - Kinki Region Travel Guide". www.japan-guide.com. Retrieved 2018-08-13. ^ "Kansai - JapanGov". JapanGov. Retrieved 2018-08-13. ^ Planet, Lonely. "Kansai travel - Lonely Planet". Lonely Planet. Retrieved 2018-08-13. ^ "Kansai | JapanVisitor Japan Travel Guide". www.japanvisitor.com. Retrieved 2018-08-13. ^ "8 Tips for Travelling in Japan's Kansai Region". TripZilla. 2016-01-29. Retrieved 2018-08-13. ^ Nussbaum, "Kinai" in p. 521, p. 521, at Google Books. ^ "School History: DSK International - World IB School in Kobe". DSK International. Retrieved 2018-11-28. ^ "Canadian Academy: History". www.canacad.ac.jp. Retrieved 2018-11-28. ^ "About". www.smis.org. Retrieved 2018-11-28. ^ "Our History - Marist Brothers International School". www.marist.ac.jp. Retrieved 2018-11-28. ^ "History - Kyoto International School". Kyoto International School. Retrieved 2018-11-28. Wikivoyage has a travel guide for Kansai.